When meeting with a legislator and their staff, communicating the economic impact your organization has on their district is one of the most impactful ways to move the needle on legislation you care about. Legislators may anecdotally know that your organization works and operates in their district, but with visually-engaging, specific figures, you can leave a lasting impact in a legislator’s mind. With Quorum, your organization can create powerful leave-behinds for congressional offices displaying your organization’s custom data, and with Quorum’s mobile app you can access your economic impact data in just a few clicks as you criss-cross the Capitol or state house for meetings. How many factories, plants, retail stores, or restaurants does your organization operate in a particular district? By mapping facilities, you can show how your business interacts with different cities and counties, visualizing the physical footprint you have in a given space. Creating jobs is always on the mind of legislative bodies, and legislators often frame their policy ideas around how many jobs it will save or create. By visualizing how many employees you have across a legislator’s district, it makes it easier for them to make the case to their constituents that a given policy is beneficial to the district. If you’re representing an entire industry in your meetings with legislators, it’s helpful to present them with a visual showing how many organizations in their district you represent. For example, if you’re a trade association representing the medical industry, show how many hospitals or medical practices exist in the area the legislator represents. If your organization makes and sells consumer goods, show how many products are sold in a legislator’s district. By showing how many constituents are using the products your organization provides, you can make a stronger case for legislation benefits your organization. Uploading economic impact data in Quorum makes it easy to show legislators the impact you’re having in their district. 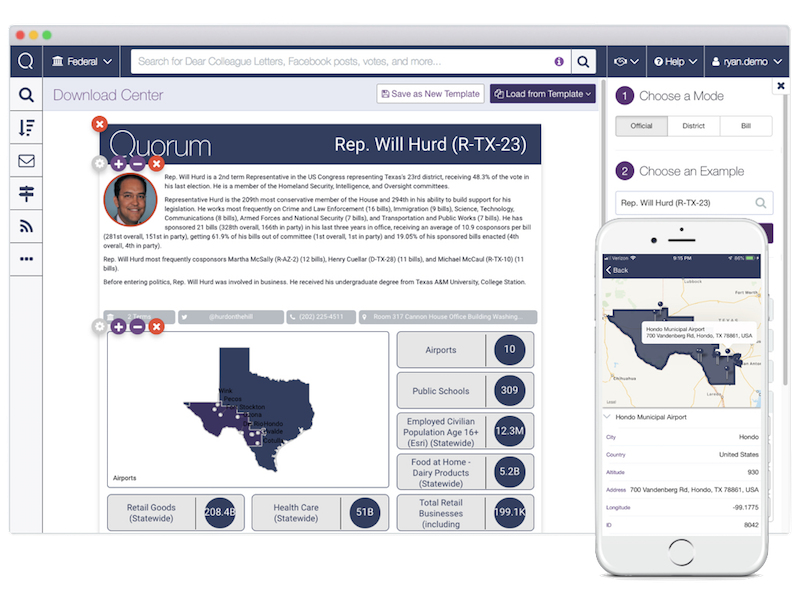 Create on-brand downloadable leave-behinds to provide legislators and staff at the end of the meetings, or have your data at your fingerprints with Quorum’s mobile app to utilize in a meeting or during an unexpected interaction with a legislator. To learn more, see Quorum in action.